YourHomeProfessionals.com is the #1 source for finding reputable and trustworthy professionals in your area. We recently worked with Your Home Professionals LLC to develop their website, identity (logo, brochures, business cards, etc), and other various pieces of design including a Facebook business page. 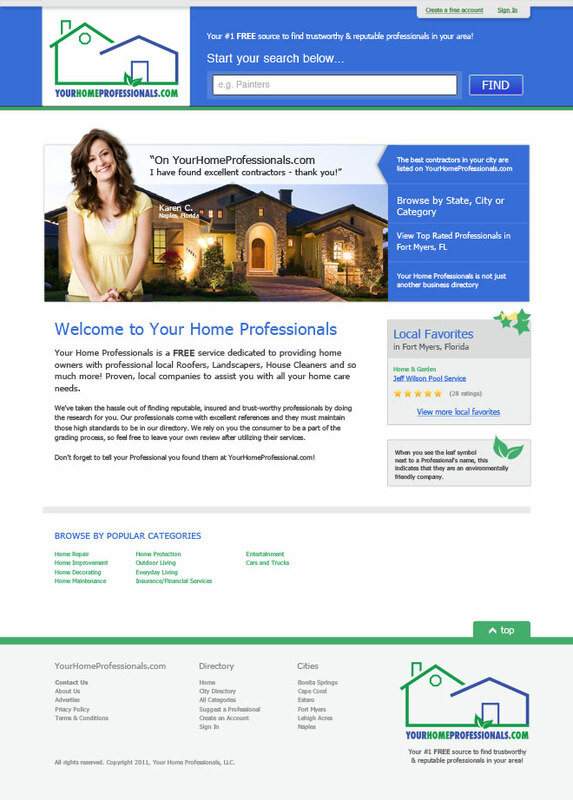 The YourHomeProfessionals.com website was developed with a powerful framework and optimized database to allow for a lot growth and expansion. The backend of the website includes a full admin controlled “franchise” tool to allow the owners to assign specific market area websites to a specific user account. On the frontend, we use some impressive levels of geolocation to present area specific pieces of content to the visitor. YourHomeProfessionals.com is currently serving Naples, Fort Myers and other cities in Southwest Florida and will soon be in various other areas across the nation. Brian Joseph Studios enjoyed working with Your Home Professionals LLC to develop a memorable identity and a powerful website application and we’re excited to continue to develop the website and see it become the “go to” place on the internet when looking for contractors and various other services.